cPanel is the most popular hosting control panel available. cPanel® and WebHost Manager (WHM®) is a fully featured all-in-one web hosting control panel that allows easy administration of your web servers, and also provides your clients with a simple to use web interface to manage their web hosting accounts. cPanel takes control of every aspect of managing your web sites with tools for email, file management, databases, and much much more. 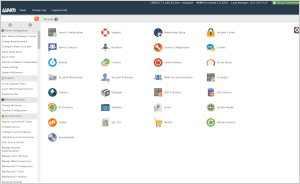 Below is a brief list of the key features of cPanel/WHM. To view the complete feature list, click here. Server Management - Within a few clicks support new web technologies, change software powering web sites and install new software modules; robust control over email, block spam before it reaches the server; automatically updates itself as well as any other software cPanel/WHM relys on; handles creation of DNS entries for new web sites. Web Host Managment - Create and modify accounts and apply hosting plans; support for reseller accounts and allocate large amount of resources; control features available to users; customise page displayed when account is suspended; easy to migrate between servers running cPanel/WHM. We provide full technical support for cPanel/WHM software related issues, however we first suggest to check the cPanel/WHM documenation. If you still have a problem or question, please open a ticket providing as much useful information as possible, and we will get back to you as soon as we can. Please be aware that you must contact us directly for support and not cPanel. Looking to order several licenses? Submit a ticket for bulk licensing discounts. * Instant activation on monthly licenses only. License transfers from other providers may take up to 48 hours, however no downtime will be experienced during this time. We are a certified cPanel distributor. Having purchased a large quantity of licenses, it has given us the opportunity to offer you cPanel/WHM at a greatly discounted rate. We provide full support for all licenses, as well as instant activation. As always, we strive to be the cheapest reseller and if you find any cheaper external pricing then we will match their price.